Actress Lauren Potter of “Glee” was recently honored with the first-ever Samantha Marcia Stevens Family Award of Excellence in Raising Awareness. The award was presented to the television star on stage at the Massachusetts Down Syndrome Congress (MDSC) 16th annual Buddy Walk & Family Picnic in Wakefield, where Potter was the special guest. Potter is best known for her supporting role on the hit show “Glee,” where she plays Becky Jackson, a teen with Down syndrome who overcomes adversity to become co-captain of the Cheerios Cheerleader squad. Brian Stevens of Marlborough presented Potter with the award that bears his daughter’s name, in recognition of Potter’s efforts to enlighten the larger society about the abilities of people with disabilities, including Down syndrome. Samantha, who is 6 years old, has Down syndrome and other complex medical needs. The Stevens family has been working to ensure that people like her have opportunities to lead inclusive, fulfilling lives. In his remarks to the 3,000-strong crowd at Wakefield Commons, Stevens indicated that he is committed to the cause. 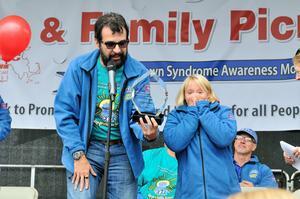 The Stevens family was on hand for the award presentation and participated in the walk, which raised close to $400,000 to support the programs of the Massachusetts Down Syndrome Congress. Donations can still be made at mdsc.org. Since her “Glee” debut three years ago, Potter, who herself has Down syndrome, has become the ultimate “self-advocate,” acting as a powerful spokeswoman for policies that bring equality and justice to people with Down syndrome, according to MDSC. In November 2011, President Barack Obama appointed Potter to the Presidential Committee for People With Intellectual Disabilities, which advises the White House on how to improve access to schools and jobs for people with disabilities.